Its Day 44 in IPL and its a 3rd place play off day. Both Last Year Finalist’s this year missing out and now playing for a place in Champions league, Gilly won the toss and decided to Bat first, As last time in finals Kumble opened the bowling against Gilly and the result is same as he was again out in the third ball of the first over (Nostalgic of last year finals) but this time to a fantastic catch by Kallis. From then on i can write only abt two ppl Anirudh Singh who scored almost half of the total and Venugopal rao who scored second max. Rest all had their noodles getting prepared in two mins, so they all r in hurry to go for it. Yep Not more than 2 mins any1 stayed in crease. When Anirudh was dismissed they were 78/6 in 15 overs, after 15 balls they were all out for 82 runs. Which really meant the innings for the day. Just in simple not a day for DC’s… RCB captain again replicated his figures of 4/16 and the real star of the day. DC 82/10 in 18.3 overs. RCB 86/1 in 13.5 overs. RCB WON THE MATCH BY 9 WICKETS. Chasing the lowest ever target in this season, RCB were at ease, No real pressure and even to say No gr8 deal of pressure from Bowlers as well, it clear that they dont have a target to defend, when ur team is bowled out for paltry 82 runs, all u can do is bowl ur overs and finish ur formalities. (U can’t offer win declare in International matches, So sad…, if it was, today was an opportunity). To write in simple, Kallis played a sedated innings, even though chasing score was mere 80 odd, and finally ended his dreadful innings by hitting one back to rohit sharma. Dravid and Pieterson finished off the match with a thumping win for RCB. Mallya got a reason to smile now, without doubt… RCB qualify for Champions League which will be held later in this year. – For the first time in this season, four batsmen have been dismissed for duck. – 69 dot balls BY Deccan’s is the max by any team in an ipl game so far. – Kallis went past Sachin in runs scored but Orange Cap is still with Sachin as the scores are valid only in the league game and this is just a play off game. – 11th and 12th Maidens of IPL are bowled by Steyn and Kallis respectively. – Dravid went past 200 runs in IPL this season and overall went past 900 runs today. – 50 scored in 9.5 overs by RCB is the slowest one of this tournament. Orange Cap – J.Kallis (572) followed by Sachin Tendulkar (570) and S.Ganguly(493). Purple Cap – Pragyan Ojha(21) followed by Amit Mishra, Kumble and Harbhajan at 17. Most Sixes – Robin Uthappa (27) followed by Yusuf Pathan (24) and Murali Vijay (24). Most Fours – Sachin Tendulkar(79) followed by J.Kallis (67). If u can think back, this is the match between Last year’s Finalist’s… Now every game becomes a Must win game for some one, Points table is clustered like hell, cant take any one into last four and leave out. Except for first and last rest all 6 teams are twisted and turned together. Today win for Deccan will make table much more interesting, if its Bangalore, then v can say competition will be between 4 teams for 2 slots. Gilly won the coin and decided to Bowl First, and usual script to be written, Kallis was brilliant and scored yet another Half century, Pandey didnt make a start which RCB would have loved, as he dismissed for 1. After him Dravid walked in at No.3 (Big Surprise), played for some time, with a Classic six over Long off. Later he was dismissed to a well bowled ball from Ojha, with him another two followed back quickly, to name them Uthappa and Ross Taylor. Playing his first game in IPL Taylor failed to make an impression. Scorecard read 68/4 in 10 overs. Again i am sure even kumble would be satisfied with a score of 150-160. At the end of 16 overs score was 118/4, this is the time Kohli started to fire in all guns, he thrashed all bowlers and took them for maximum. late sixes from White made sure RCB cross a total of 184. 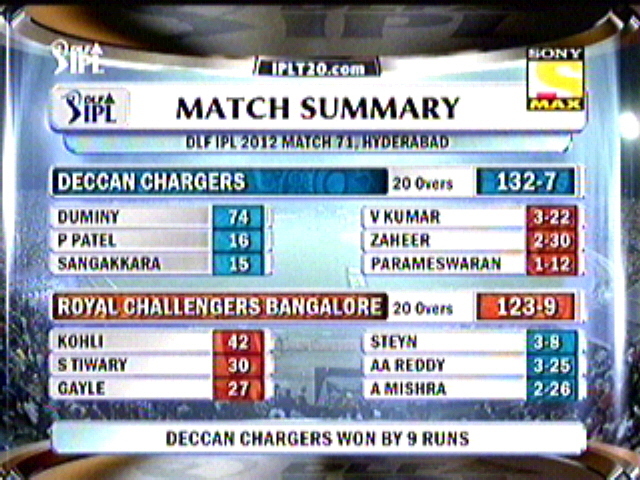 Once again Deccan’s proved why they are the worst in last 6 overs. As RCB accumulated 92 runs in last 6 overs. RCB 184/6 in 20 overs. DC 186/3 in 19.2 overs. DC WON THE MATCH BY 7 WICKETS. A team who needed just 6 runs in last over with 3 wickets in hand, failed to achieve it. This is what Deccans will take into chase, As usual another dismal start from some opener, this time Monish Mishra as he was caught behind for 9, with score 11 in board. Suman and Gilly continued to haunt RCB and kept the run rate in and around 10 all the time, Kumble brought himself back on to remove Gilly who looked almost settle this time, and double strike came as Rohit sharma was also dismissed in space of 6 balls. Once again Chase began to play trick for DC’s, as they haven’t chased this big score so far in IPL. Suman was joined by Symo, Its always said, Big players deliver at the right time, did they say after seeing Symonds…? Ofcourse he did deliver with a beautiful aggressive innings to clinch the much needed victory for DC’s. 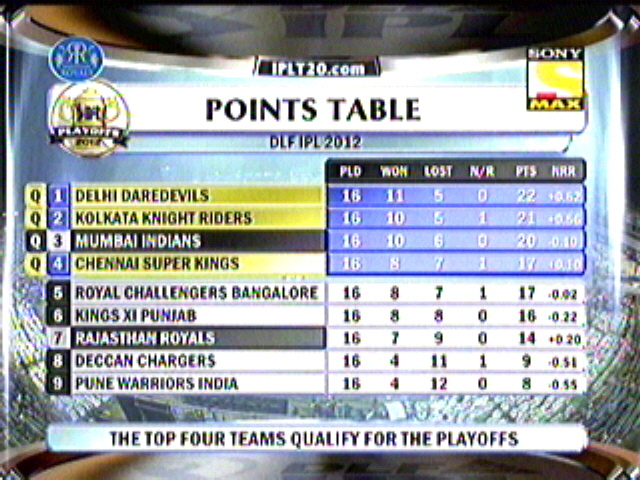 Which meant now RCB still in 10 points and DC’s move close to 10 pointers with 8 point now. as i was saying in the front, Points Table, its time to take bets… Only gambler can predict these situations…. – Suman Scored his Maiden Fifty. – P.Ojha went past Amit Mishra to gain the purple Cap. – Race for Maximum no.of fours continues as Kallis went past Sachin today, now he is with 61, 3 ahead of Master. – 186 runs chased is the highest ever run chased by Deccans so far in IPL History. – 186 is also the highest ever scored by Deccan’s in IPL. – J.Kallis scored the 6th IPL fifty. Orange Cap – J.Kallis (493) followed by Sachin Tendulkar (394) and Naman Ojha(352). Purple Cap – Pragyan Ojha(15) followed by Amit Mishra(14) and Muralitharan(12). Most Sixes – Yusuf Pathan (23) followed by Murali Vijay (20). Most Fours – J.Kallis (61) followed by Sachin Tendulkar (58). IPL 2: Final.. Its DC Vs RBC..
First a word on both teams, Last year these two teams bagged the position of 7th and 8th respectively. Just a turnaround fortune’s (guess i cant say that) this year as of now they are into finals, eliminating, the top two teams who lead the standings table for most of the times (Delhi and Chennai). Finally its time for finals, and two captains came together for toss and Kumble won the toss and decided to continue his successful chasing record, Gilly wasn’t worried much abt losing toss, he pointed that he would like to score 160 to 170 to put pressure on the opposition. Kumble himself started the proceedings for Challengers, and what a way to start, they had Gilly the dangerous man right in the very first over for a duck… Skipper undoing a Skipper… What a way to start the things for RCB, later suman also fell, feeling the pressure… Later Symonds had few shots punching inside and outside the ground, but all those were like daggers in the heart of Rahul dravid, has he dropped a sitter in slips when he was in 5, finally he went on to make 33, but it needed lion hearted kumble to pick the batsmen again, captain leading from the front. at 10 overs timing, they were just 62/3…. RCB felt really good in the score.. Both Gibbs and Rohit began the second off the deccans innings with caution and started milking the singles and doubles by picking the gaps, Finally sharma broke the shatters and slashed one over the ropes, but he was very soon done by the Kumble’s brilliant bowling effort, two balls later venugopal also fell for Jumbo’s magic… On the other hand, Gibbs went slow and steady and scored his 4th IPL 50, a timely knock from the player who opened the innings and stayed till the end… Its always good see any one of the opener fails, other compensating for the loss… Finally few hard running between giibs and Harris allowed DC to reach a par score of 143/6 in 20 overs. Kallis and Manish Pandey started the innings for RCB, Harries started well with a another first over maiden (remember he also a bowled a first over two wicket maiden in semi finals.). Kallis went for few good looking shot, but its purple cap holder, who took the revenge by pitching one shot and Kallis mishitting to stumps. Later Van de merwe, really eased the nerves of RCB as he pulled, drove and took the bowlers to some vicious shots, but not before foxed by Ojha, who also removed Manish pandey cheaply for just 4. by 10 overs time, RCB are 69/3 with dravid and taylor in crease, RCB felt they have a certain chance of winning, even if these two cary for another 5 overs, but it didnt happen, as dravid went for an expensive paddle shot and finally losing the stumps to harmeet singh, But taylor didnt give up as he pulled Ojha for a six and brought the run rate down, but It the over os symonds which changed the whole course of the game, which had a Ross mistiming his pull and very next ball, Virat Kohli losing his balance in crease and Gilly isn’t a person who could miss those… Double strike left RCB speechless and optionless as the runrate was also creeping slowly to 12 and above… Boucher and Praveen fell very soon then but Uthappa and Vinay kumar holded for few mins and gave a hope for RCB that they could make it… But its the purple cap owner, who came to the occasion and bowled a very tidy last over to all DC to win by 6 runs in the END…. – 31/2 is the lowest ever score recorded by DEccan’s in their first 6 overs. – Gibbs scored his fourth fifty, in his fav ground in SA. – Among the players who scored 250 runs and above Gilchrist has the highest stirke rate of 152.30. 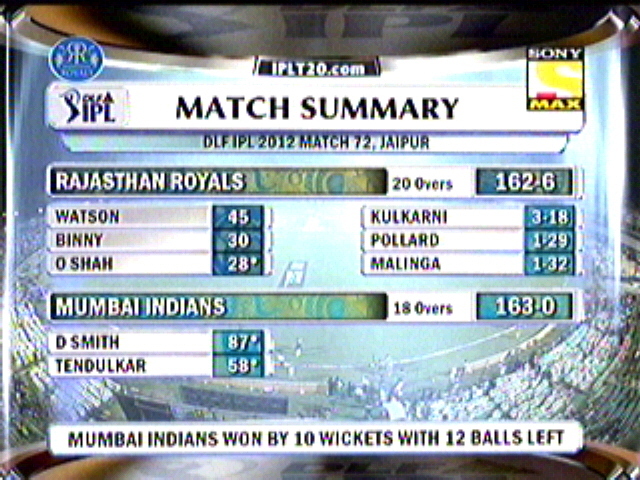 – With 23 wickets RP Singh holds hard to the purple cap. – This just the second game in wanders that a team batting first is winning, previous was did by CSK against delhi. – Kumble joins the list of bowlers who have taken 4 wickets twice in a match along with Yusuf Abdulla of KXIP and Jakathi of CSK. – With 362 runs, 11 wickets along with an Hat Trick and 5 catches, Rohit Sharma becomes the CITI player of the tournament under 23. – Deccan’s haven’t lost a single game, which ever Harmeet singh played for them , he played 7 games and deccan’s won all the 7…. – Among the players who scored 250 runs and above Gilchrist has the highest strike rate of 152.30. Not a very important game for both the teams, Delhi will look to have a winning momentum before they get into semi’s. Mumbai will try to have a game for pride before they pack their bags. Shewag won the toss and decided to field first, Mumbai back with the traditional openers, Sanath and Sachin, but it didn’t last long, MI lost wickets in quick successions leaving 28/3 in 4.3 overs. Then Skipper joined with rahane to build the innings and gor MI beond 100 run mark and got himself out, then nothing was so gr8 rest chipped with few numbers to name ending the innings with 165/8. Bowling, Nannes and Sangwan bowled really well to chip up with wickets. Delhi seemed so cool right from the beginning, No panic at any stage, Back in form Shewag and Gambhir stirred the things up well for delhi and its in the end its a cake walk, In simple, delhi had a nice icing on the cake in the end of league matches. Shewag and Gambhir back in form, bowlers doing a fair job and everything is looking good for Semis 2maro. Bowling, cant really pick much, other than Bhajji who came close twice to pick up a Hat trick, other than that, its all just underwritten…. 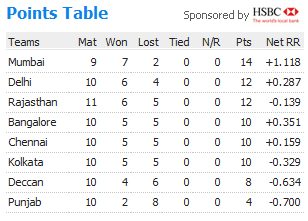 Finally delhi top the table with 4 wicket victory. A fairly important game for RCB as they will keep an eye on the Net run rate and Deccans are more comfortable to get in at any cause. Kumble won the important toss and decided to Bat first, Which is right, bcos u never want to have net runrate in mind and u go in for a chase. (finally u may end up exiting like south africa did in T20 world cup). I think RCB have a curse on the no 7, this is 3rd time for them a wicket fell on 7, this time its Kallis, instead of Uthappa… later Van de merwe and Manish Pandey carried the innings well with a reasonable scoring rate. The real show came, when the 19 year boy from Karnataka, went berserk against the bowlers, and went on to score the first T20 century by an Indian, this will be the best feeling for his life time. in the ned, few sixes from Virat Kohli helped RCB to get a score of 170/4 in 20 overs. Bowling, Except Ojha and Symonds, none seems to be impressive, Rp singh purple cap holder, went for plenty today especially in his last over he went for 23 runs, which was the big over of the match. The equation was If DC wins the match in 11.1 overs, then RCB may lose out in Net run rate and KXIP can sneak in thru. As always, deccan’s had a good start courtesy Gibbs, he scored at fast pace, and gilly kept knocking the singles around him, finally gilly was out when he tried to pull a slower delivery of akhil, score was 68/1 in 6.5 overs. Things looked good, but RCB ensured they kept hunting down the wickets in the regular intervals, which didn’t allow DC’s for a stable chase, Bowling looked really good, Akhil and Jumbo picked couple each and rest bowled a decent ones to restrict DC’s. In the end, DC failed to reach the target by 12 runs, think back, how costly the last over of DC was…. U cant blame any1 now, finally its a unexpected and resurgent RCB making the way to 3rd place in table and will face Chennai a day after tomorrow in Semi finals 2. Semi Finals 1: Delhi Daredevils Vs Deccan Chargers on 22nd night 8 Pm. Semi Finals 2: Chennai Super Kings Vs Royal Challengers Bangalore on 23rd night 8 Pm. – Last ball by JP duminy went for a six, which is also the first ever six scored against by JP Duminy’s bowling in this tournament. – Shewag scored his first 50 of this season IPL. – Ironically Mumbai scored same 165 in the opening game of IPL 2 against CSK, and they went on to win by 19 runs. – 4/17 is the best bowling figures of Harbhajan in a T20 game. – 24 runs is the second highest number of extras conceded by any team in IPL 2, Mumbai is in the top with 26 runs against CSK. – Bangalore scored 106 runs in the last 10 overs. – Manish Pandey became the first indian to score a T20 Century, this is also the second century in IPL season 2, Villers scoring the first one against CSK. – Gibbs scored 3rd fifty of this season, which make him the only deccan batsmen with 3 r more fifties. – Praveen Kumar recorded his worst bowling figures, as he went for 45 runs in his 4 over spell.